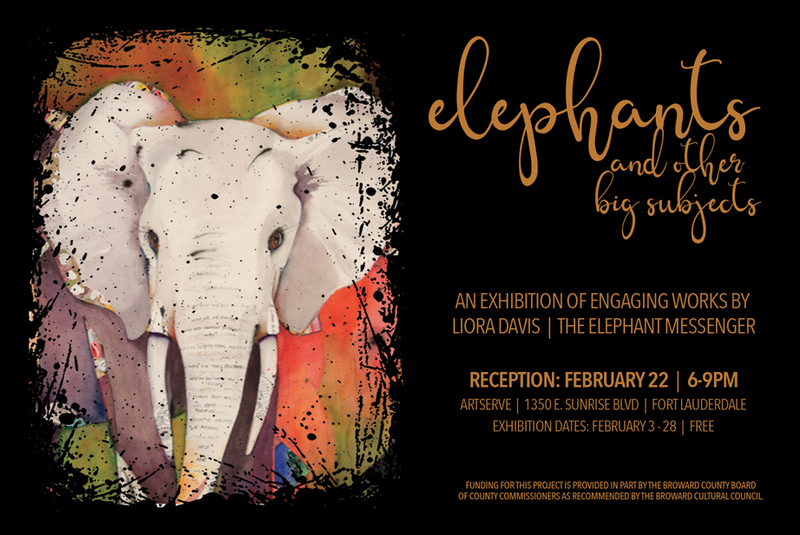 FORT LAUDERDALE, FL -- The Broward based artist, Liora Davis, known as an Elephant Messenger, is raising her brush in order to shed light on the grave and critical situation in which elephants are at risk of extinction. Liora and many experts believe that our actions and decisions as humans now will make all the difference in ensuring the survival of elephants. 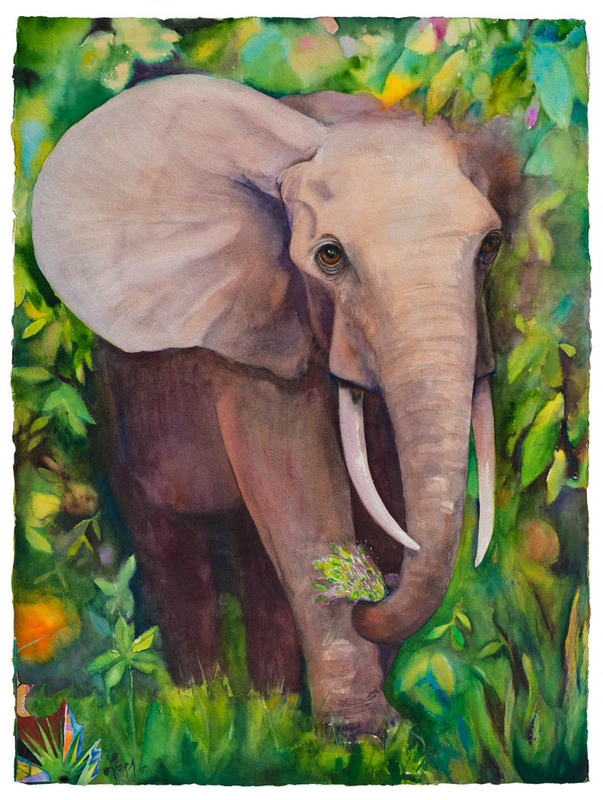 The “ELEPHANTS AND OTHER BIG SUBJECTS” exhibition, on display at ArtServe in Fort Lauderdale from February 3 - 28, will also feature the inter-connectivity of our world and will display a selection of art pieces displaying some of the beautiful native Florida plants and wildlife which are currently facing environmental challenges. One of Liora’s signature pieces, "Wake UP, Save the Earth!" is a statement about how we need to respond, speak up, and engage pressing environmental challenges in order to preserve this beautiful and vulnerable planet for future generations. 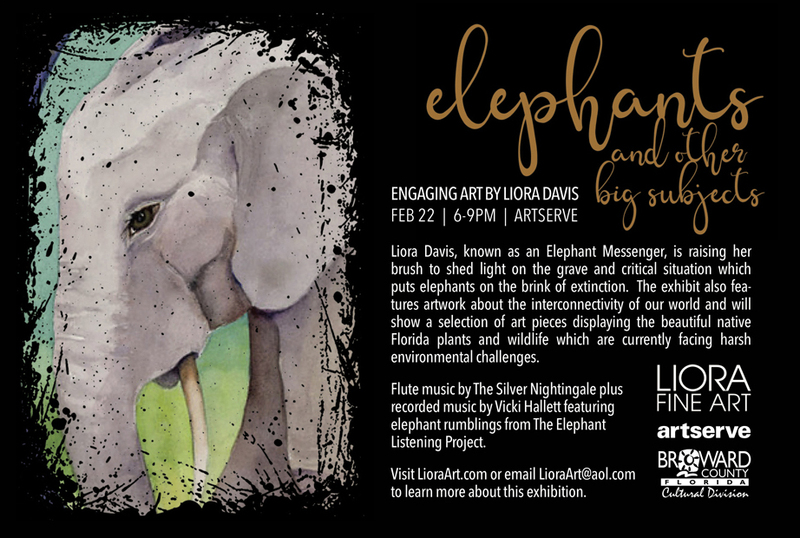 Guests will experience music by Laura Sue, The Silver Nightingale as well as recorded music by Vicki Hallett featuring elephant rumblings courtesy of The Elephant Listening Project. The exhibit is open to the public February 3 – 28. A portion of proceeds will be shared with The Elephant Listening Project, The David Sheldrick Wildlife Trust, and The South Florida Wildlife Center. Artserve is open to the public from 9- 5 pm, most weeks 7 days, but do call about Sundays. Funding for this project is provided in part by the Broward County Board of County Commissioners as recommended by the Broward Cultural Council. Parker Playhouse Fort Lauderdale, FL. Species are disappearing at an alarming rate. Some say that we are in the middle of World's Sixth Mass Extinction, which is arguably brought about by human activity.What’s causing this? Habitat loss and habitat fragmentation, poaching, exploitation and trade of body parts, climate change, pesticides, herbicides and other chemicals in our environment all are factors. Extinction is forever. The purpose of this exhibit is to shed light on this grave situation and the magnitude of species at risk. However, we are not here to spread doom and gloom. It’snot too late for many of these species, and our actions and decisions as humans now could make all the difference, especially to keystone species, like elephants. These are species that are intrinsically linked to our own survival. The canary in the coal mine is gasping for breath. Our own fate as a human race may be determined by ‘that which we do to the least of these’. 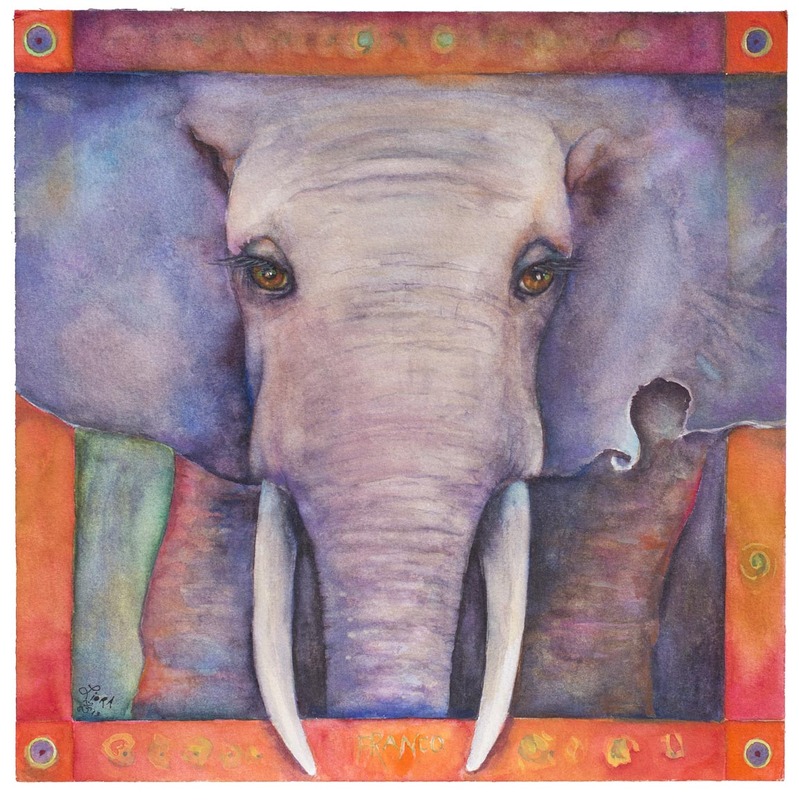 Tuesday, February 16, 2014 6 - 9 p.m.
Why do I paint elephants? Since the cost of ivory has skyrocketed, organized crime and terrorist groups are using it to quickly get money. 50% of proceeds of Liora’s Elephant pieces will be donated to The Elephant Listening Project and/or The David Sheldrick Wildlife Trust. 30% of proceeds of Student Artwork will also go to support these organizations. At an early age, Liora was profoundly affected by the quote by Robert Kennedy; “There are those that look at things the way they are, and ask why? I dream of things that never were, and ask why not?” Her love of art and beauty led her to attend Parsons School of Design in New York, which honed her eye for design and color. Living and traveling in Europe as an adult has had a great influence as well. Liora grew up in Norwalk, Connecticut, and has been living and working mostly in South Florida since 1986. She has been a full time artist since the late eighties. Commissions have been created in South Florida for The Stranahan House (their centennial poster), The Bonnet House , Sunfest, and The Las Olas Art Fairs (5 of their official posters). Others include Easter Seals, and The Red Cross Designer Show House in 2007. Liora designed and created a series of murals at Joe DiMaggio's Children's Hospital in 2005. Early in her career, she was commissioned to paint 2 wooden eggs for the White House Easter Egg roll. That year, she was in the company of Andy Warhol, Robert Rauschenburg, and Maurice Sendak, to name a few. Those pieces all are housed in the Smithsonian Museum's permanent collection. 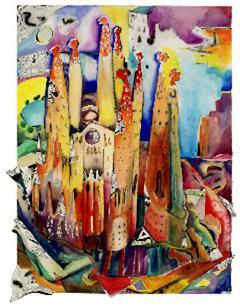 Exhibits include a solo show at the Gildo Pastor Center Gallery at The World Trade Center in Monte Carlo. Here in the U.S., there were a series of solo shows at the Northern Trust Banks, Broward College and numerous galleries. Collections include The Smithsonian Museum, the Virginia Beach Center for Contemporary Art, The Art of Living Foundation, and The Northern Trust Bank. 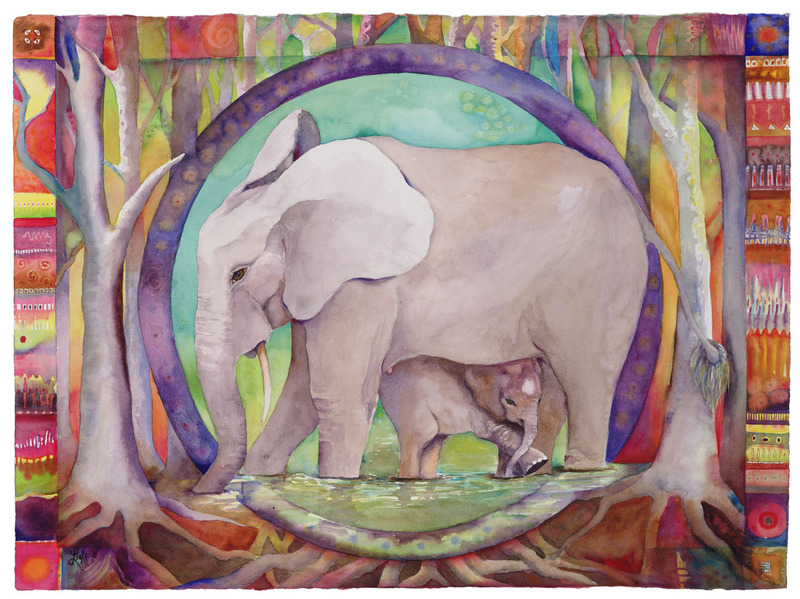 BRIEF: The Elephant in the Room exhibit at Parker Playhouse, Fort Lauderdale. The exhibit can be viewed during box office hours, Tues-Sat. 12-5pm. An intimate showing of my latest elephant pieces (and one rhino!). 50% of proceeds of all ele and rhino pieces will support ELP and DSWT, the organizations whose photos I work from. At the same time view Art Bravo, in the main gallery. The Exhibit runs from January 3rd through January 30th and can be viewed Monday through friday til 6pm, check for evening and weekend hours with Artserve. This exhibit will focus on elephants, and to shed a light on their beauty, their tenderness and how similar they are to us emotionally in an effort to raise awareness of their plight. Liora’s art reflects an urgent need to act decisively to ensure the survival of this iconic species. Elephant populations are being decimated, with estimates of 35,000 or more being killed in 2012 and 2013 in Africa alone, each year that is approximately 10% of their current population. The soaring price of ivory has put a price on each elephant's head. Thursday, March 6, 2014 6 - 9 p.m. I am also painting the orphans from The David Sheldrick Wildlife Trust. Check out their website to learn more about what they are doing to stop poaching and about their orphan project. ” http://www.sheldrickwildlifetrust.org/ Since the cost of ivory has skyrocketed, organized crime and terrorist groups are using it to quickly get money. 50% of proceeds of Elephant pieces will be donated to The Elephant Listening Project and/or The David Sheldrick Wildlife Trust. 20% of proceeds of Non elephant pieces will also go to support these organizations and other organizations that protect and care for elephants. Liora will also be showing pieces spanning the last two decades of European Architecture, Mandalas, and my Backyard Series along with other works. This will be the largest showing of her works to date. the South Florida Chamber Ensemble. taste cheeses from around Europe. for information about tickets and the musicians. of County Commissioners as recommended by the Broward Cultural Council.